We fans of the iconic Dr Who were saddened when Christopher Eccleston stepped down from the lead role in the revivified series almost four years ago. Many were disappointed when floppy-haired David Tennant stepped into Eccleston’s veteran, steeled void and re-imagined “the Doctor” as a foppish but likable hipster, eschewing his predecessor’s German submarine commander look. But Tennant grew to own the role, and I am surprised to hear myself voicing the opinion that he has been the best Doctor ever. That’s right, even better than Tom Baker and John Pertwee. Mind you, Baker and Pertwee never benefited from the enormous budget of the new series, nor from the more thoughtful and adult-oriented writing. Nonetheless, Tenant has come to personify for an entirely new generation the physical incarnation of the most important science fiction character in British history –perhaps in television history overall. So we were saddened again to hear that David Tennant would be stepping down some time in 2009, after a mere four performances, to make way for yet another actor to play the mighty Doctor, genius Lord of Time who vanquishes foes and defends the weak without ever taking a life or even striking a blow. Note that the evolution of Doctor Who was listed in Skiffy’s top 2008 stories in science fiction. Woman or non-White man, it would have been interesting to see the Doctor blend into scenarios throughout Earth’s history. A Black Doctor materializing during the European slave trade? A female Doctor appearing in an orthodox Muslim community? The possibilities are intriguing. Now, I am certain that Mr Smith is an excellent actor. 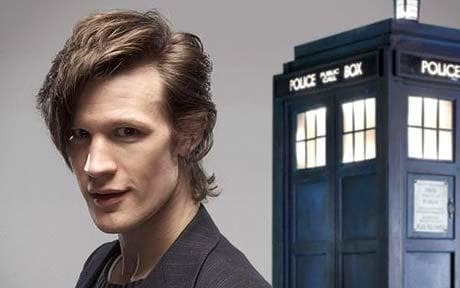 (The irony here is that The Doctor often goes by the monicker, “Mr Smith”). My objection, beyond the disappointment of not seeing a woman or a Black man, is that Smith is young. Tenant was on the verge of looking too young for a world-weary 900 year old alien who’d seen it all, and he was in his late 30s when he started the role! I really dislike this trend of casting younger and younger actors to play roles of great gravitas. Plus, as one commenter put it, he looks like the singer of a pointless emo band. Well, the Who team gave us two excellent initial choices in Eccleston and Tennant. So I’ll give this fellow a chance. But, David Tennant…. why? WHY? Previous PostThings For Which I Am ThankfulNext PostA Good Day…. Or Is It?